Can you believe it?!!!! 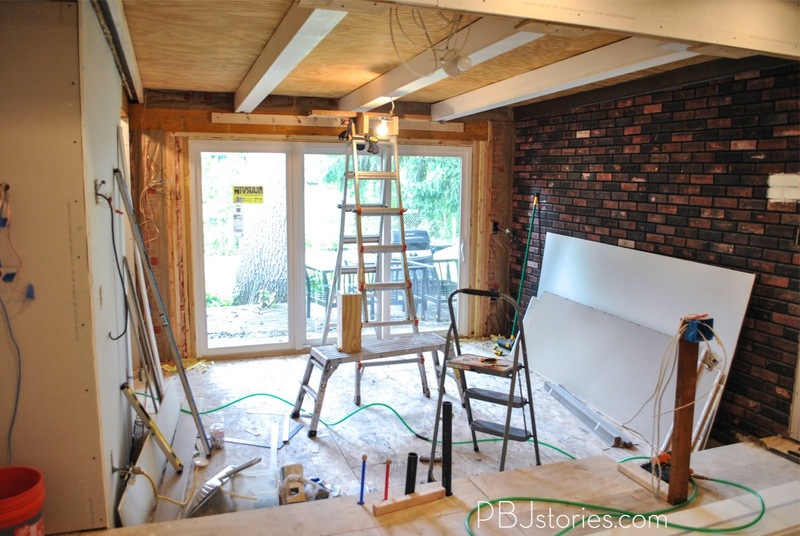 I'm not even talking about this room transformation yet (we'll get there) I'm talking about the fact I'm sharing a "reveal" of the massive-forever-ongoing-never-ending-PBJreno!!! 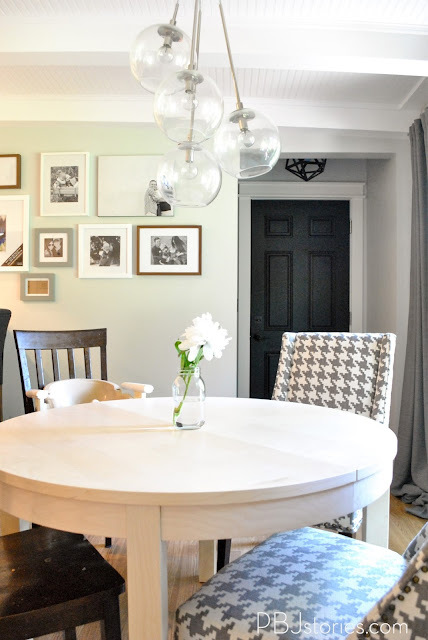 I wasn't expecting to show the dining room before the kitchen, but this space is fairly complete and I NEED to show you guys because you deserve to see some progress! Here you are, our dining room! It underwent a BIG transformation, so here's a quick reminder of the beginning (as it's been a year since you all have seen it). Originally this space wasn't used as the dining room. Honestly, I think they used it as complete wasted space. It's right off the kitchen and on the far wall was their kitchen pantry. They had a traditional 6' sliding patio door, with lots of wood paneling and complete with dated fake brick wall. We knocked out the exterior wall due to dry rot we found, plus had to replace the header and expand the opening for the new 9' patio door we were putting in. Then we ended up knocking down the wall that blocked this space to the kitchen, remove the column, put in a expanding header to open the space up. We also knocked down the pantry they had and framed in an interior door access to the garage and a little drop zone/entryway area. 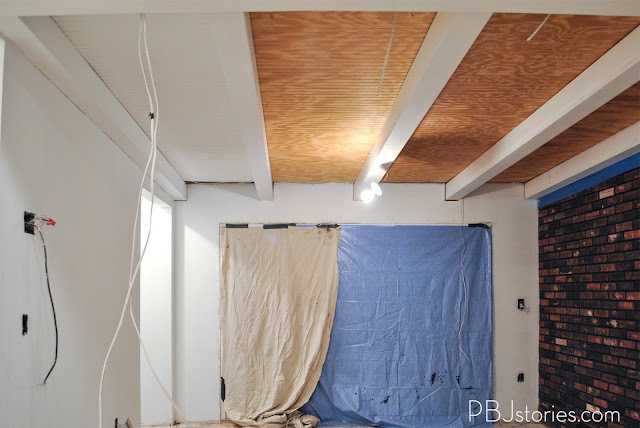 Then came time to bulk up the beams, add sheet rock and paint everything a bright beautiful white. You can already see it coming together can't you! 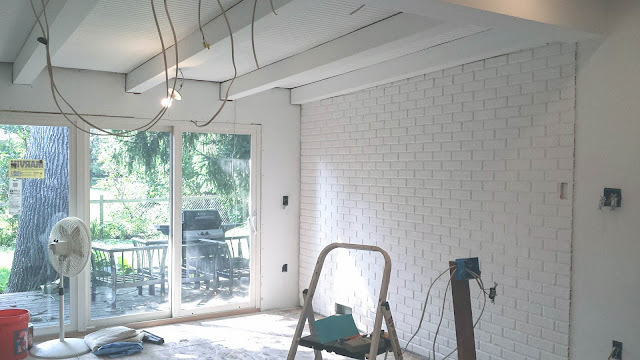 Next up was painting the brick wall white too. During all this we also ripped up the flooring, releveled the entire floor (thanks 50's home builders, who needed to use levels anyways), and installed new floors. ^ I'm sealing the subfloor to prep it for installing grates on the part of the floor that downslopes. 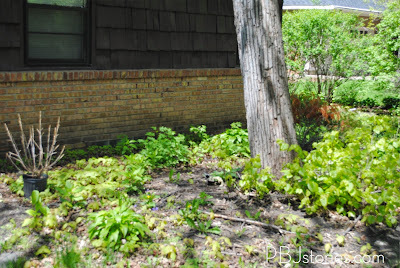 The floors sloped downward from the exterior wall inward. 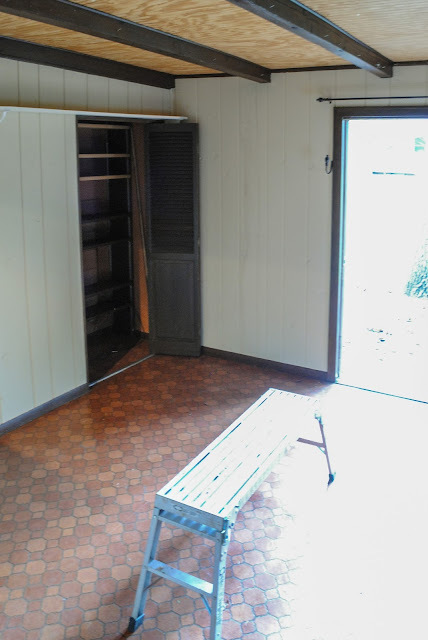 We installed metal grates, and then poured leveling concrete over the entire floor to even it out. The purpose of the grates are to collect the leveling concrete easier to build it up even with the rest of the floor. Next we just installed laminate wood floor in this area. We decided to use laminate as it was durable enough for this space (dining room chairs, traffic in and out of the patio and garage access, kid toys, etc) but inexpensive enough we didn't want to invest a lot of money at this time when we have a ton of other to do in our home. 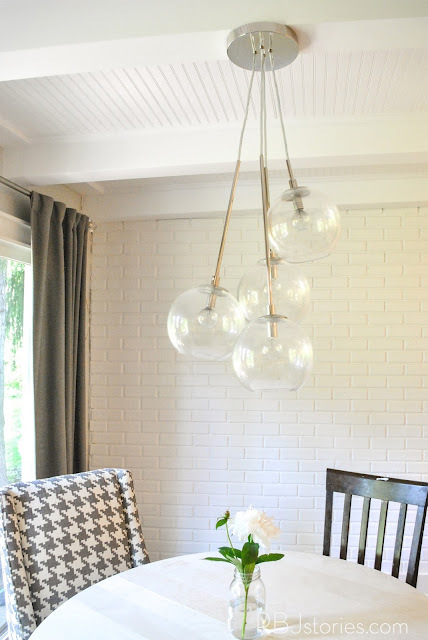 Then it was time to paint, fill with decor, and find a table that fit the space. Do you just love it? We love it. This is a pretty impromptu reveal, so I hope to share this space as you can see it from our kitchen soon. It's an open space from the kitchen, and a custom breakfast bar we built to create one large flowing area. It's so open. It's gets so much beautiful sunlight. And I just CANNOT get enough of how much I LOVE the ceiling and brick wall now... the major change a little TLC and paint can do! Can you believe the difference in the ceiling? 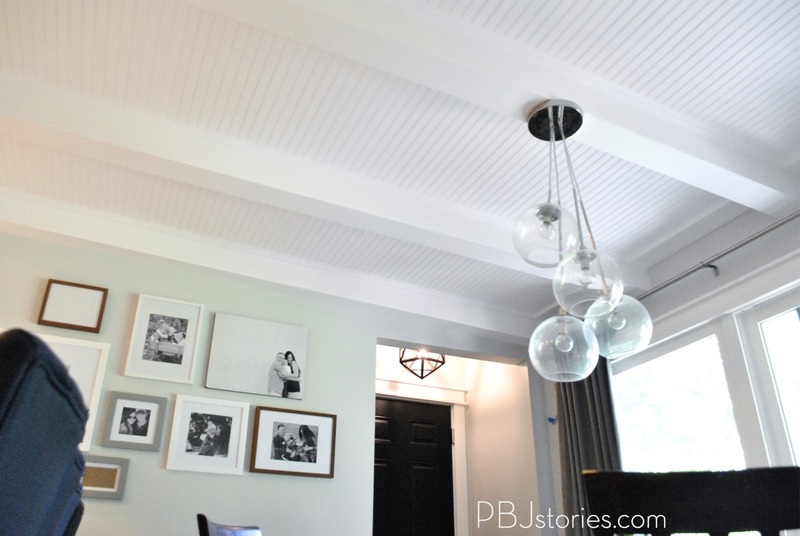 Bulking up the beams, adding trim, and a few coats of white paint TRANSFORMED it. I LOVE it and love the custom look and feel of it! 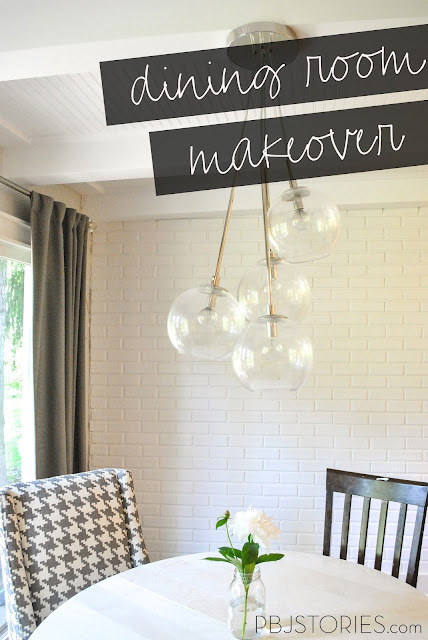 Now I'm all revved up to show you a few more changes we've made throughout the home. We still have LIGHTYEARS until we're done. It's a major work in progress... and I mean it. We literally are always in the middle of a project (as I'm staring at an completely opened/exposed wall in our living room). 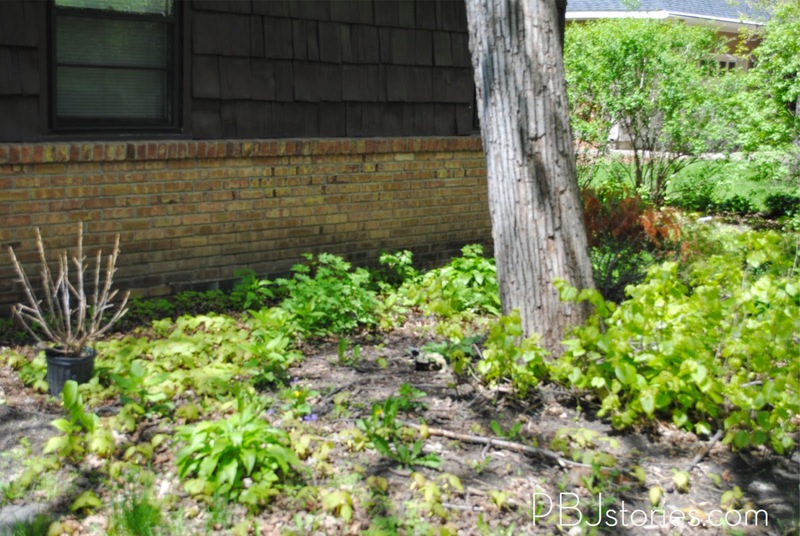 You all have seen our house and all the work that needs to be done... but I haven't ever shared the outside, lawn and the current "yardscaping". Let me tell you, it's NO better than the inside. The yard is a mess. And I have no clue how we're going to bring it around. These were from last year, but we didn't make any improvements so it's still looking the same come this Spring. 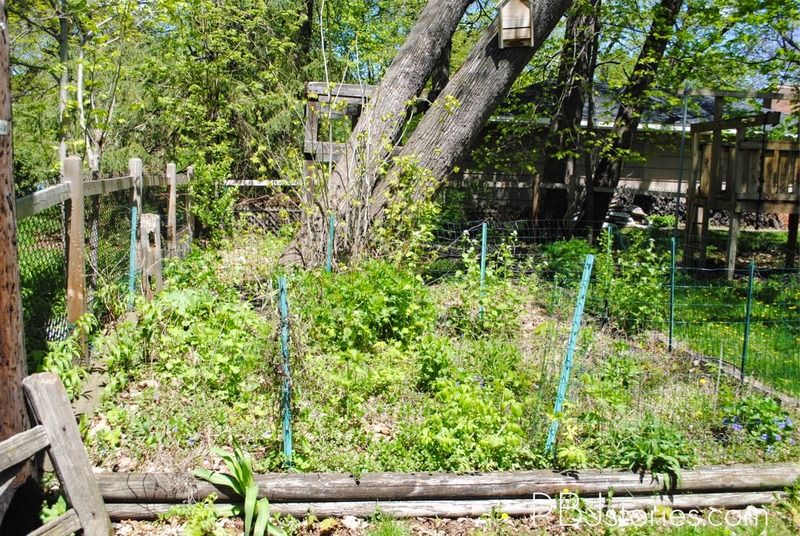 Above is a shot of part of the front yard "garden". 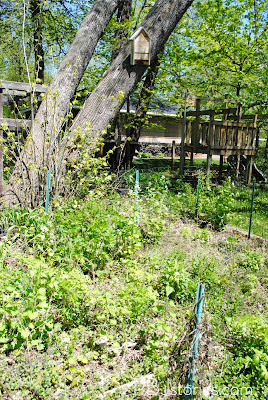 We have a ton of Basswood trees in our yard and they're terrible. 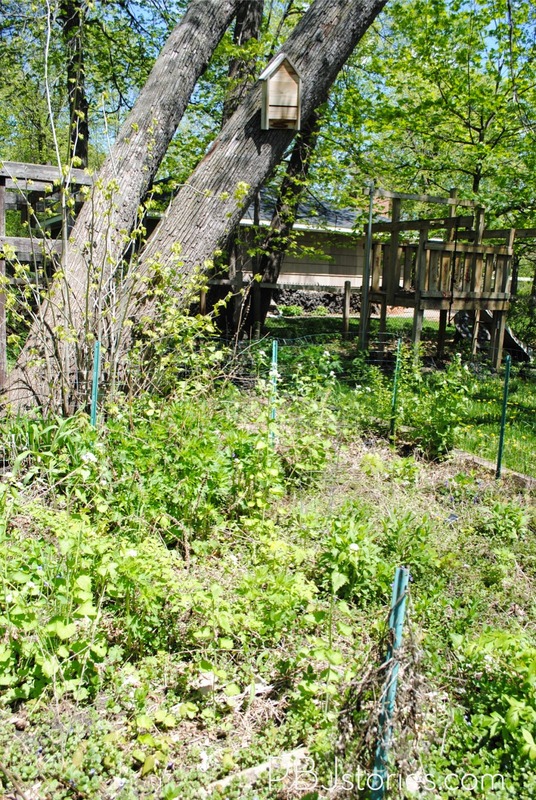 They have really weak trunks as they age and are prone to leaning and their roots coming up front the ground, and eventually breaking from the pressure. Awesome right. Now here's where it becomes a true disaster... behind those trees is this weird left over structure that maybe at one point was a jungle set? Honestly, no clue. And right next to that is an actual jungle set... that we don't let our kids go near. Oh and our lovely previous owners left lots of random garbage and old toys for us too... as you can see the awesome trampoline in the background too. 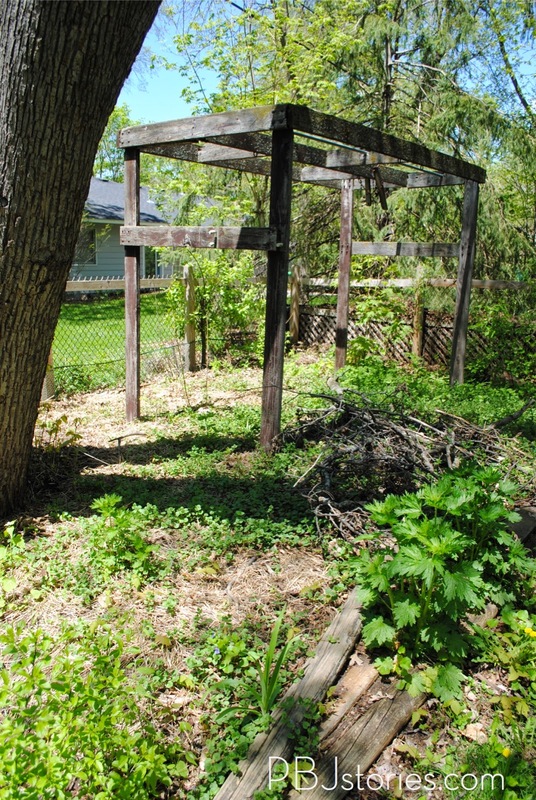 Here's another nice shot of one of our gardens.... beautiful right? This one part has changed... we ripped down the three season porch when we demo'd the kitchen a year ago. 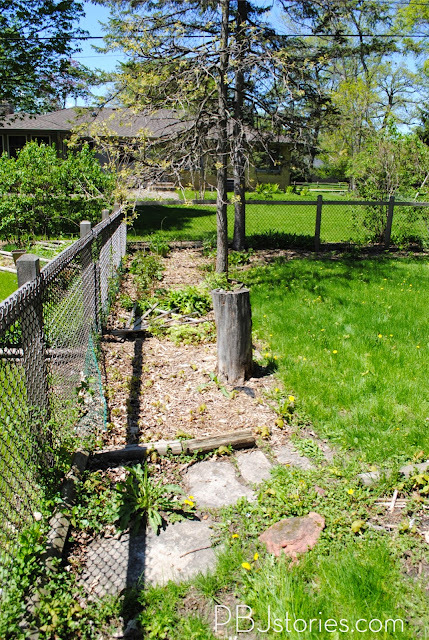 The footers were completely rotted out so we knew it had to be removed. When we had the dumpster we just thought why not. 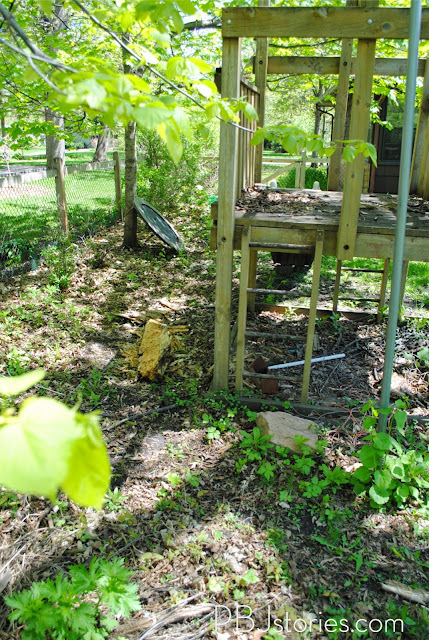 We have no clue what we're doing in our yard... so that'll be interesting year over year trying to fix it up as we're renovating the inside. 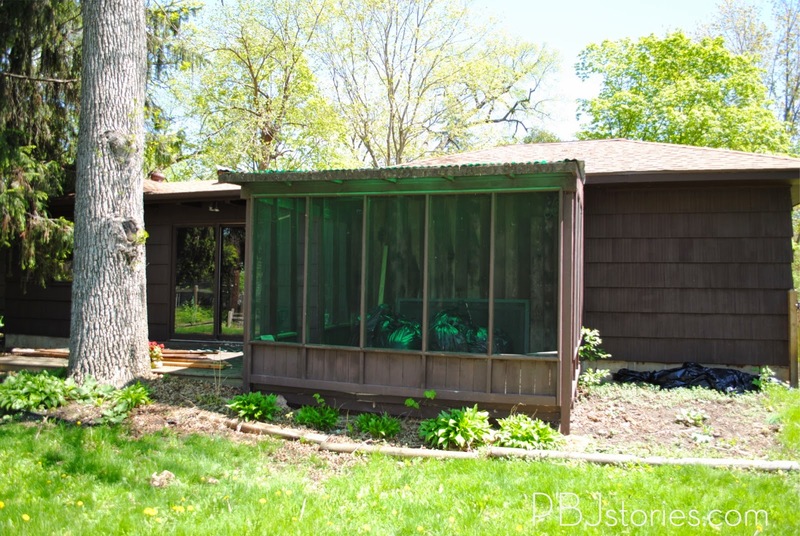 Were we just insane to buy this house or what? Okay, let's get back to the juicy stuff. OUR HOUSE! So we've tackled the kitchen/dining room. We have a FEW minor projects I've been ... 'tackling' for about 8 months now (seriously) being the cause of why this room hasn't had a full reveal yet. But if you follow me on FB & IG you definitely have seen enough to know what we've done to transform this space. 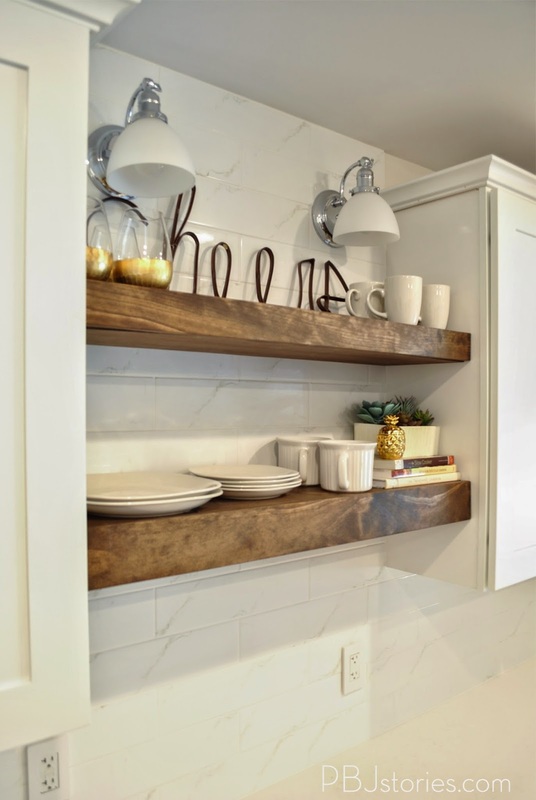 Now let's talk specifics, I knew the moment I walked into this space I wanted open shelves... and once we started quoting cabinet costs I REALLY knew we'd do open shelves. 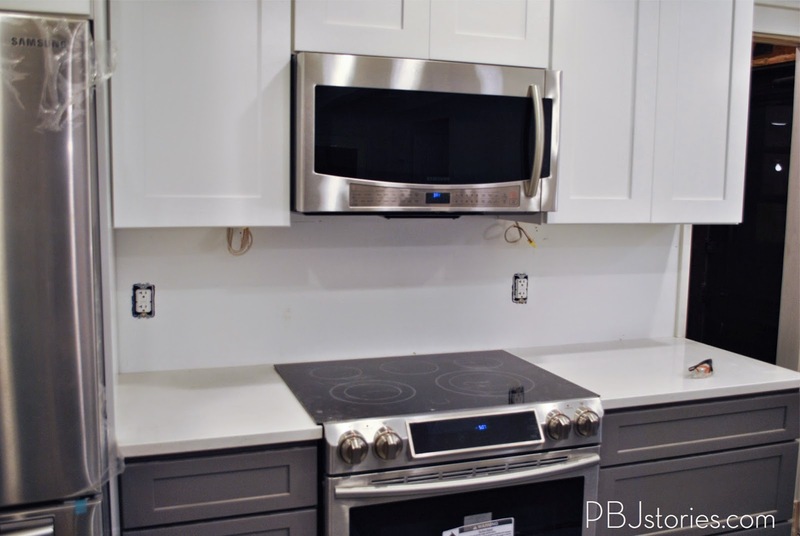 The layout in the kitchen allows for quite a lot of cabinets, and as a family of four coming from a previous kitchen layout that had a ton (TON) of kitchen storage space I knew we had to be functional with the layout. 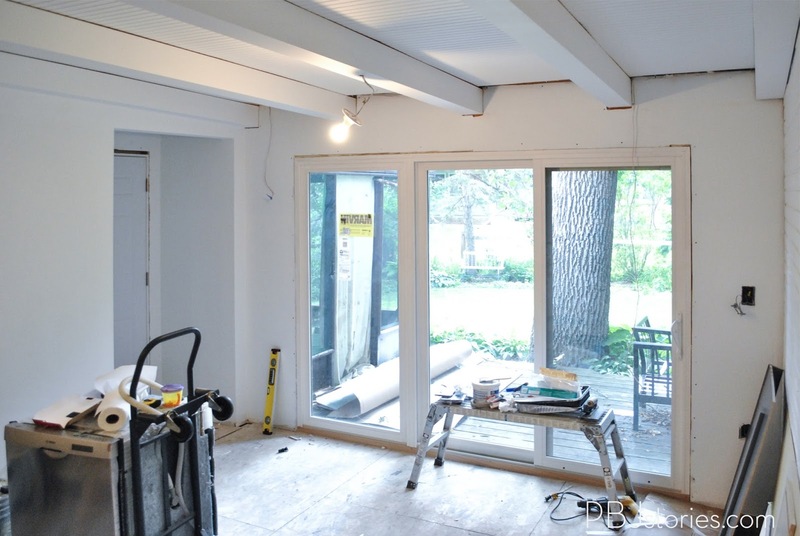 With all the necessity for cabinets, our costs increased super quickly. 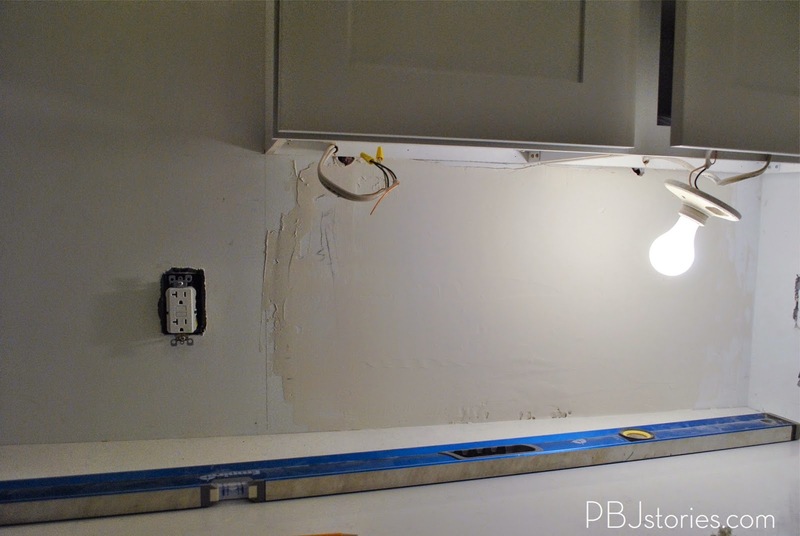 So, it was the perfect solution to this wall that had all upper cabinets and lower cabinets to break it up with open shelves. 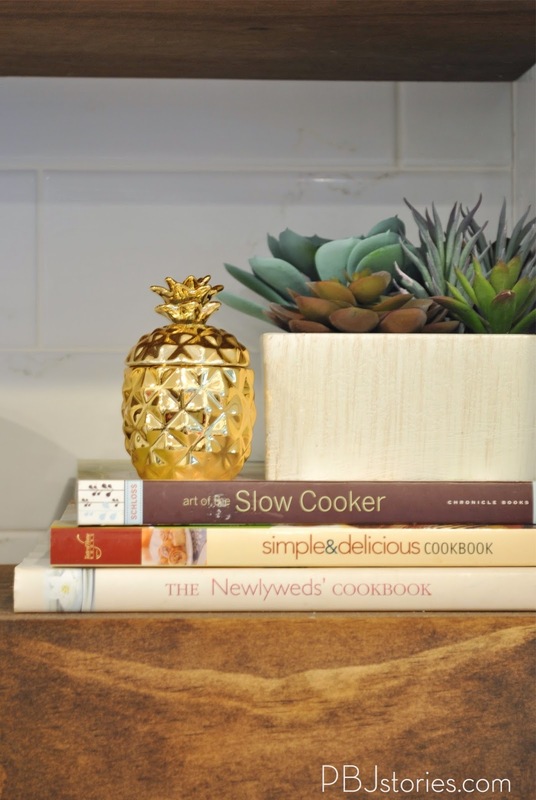 And of course, why buy when you can DIY! That's the before, before we built the shelves, before I replaced the broken pendant light and before I finished the top of cabinet molding. Hey at least I had installed the hardware at this point. (seriously 1 project no matter how minor still takes like 5 months to finish around here) What's so great about this is this is the focal point when you walk in the kitchen. It's dead-ahead and I love that we broke up the upper cabinets with the idea of open shelves. 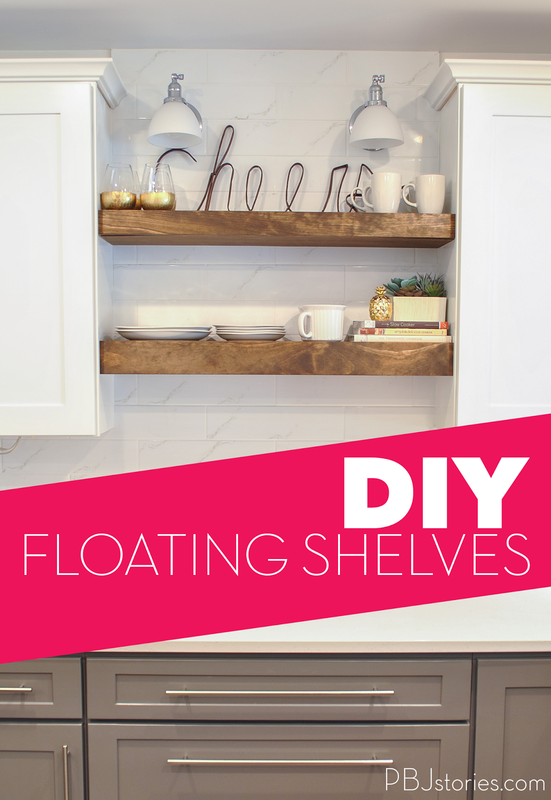 So of course I go to my go-to girls for ideas how to build the best floating shelves, Shanty2Chic gals. Their plans were the perfect foundation to my plan... which is always best. Try to make every project you do your own in some small way. 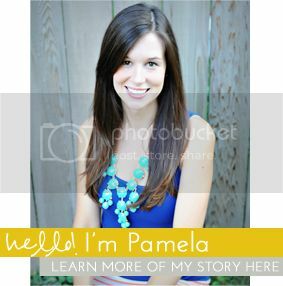 Adapt a template, add a step, change the color - something, do something to personalize any DIY tutorial. Above are the "guts" of the floating shelves. The goods that you need to make the skeleton that lives inside the shelves. 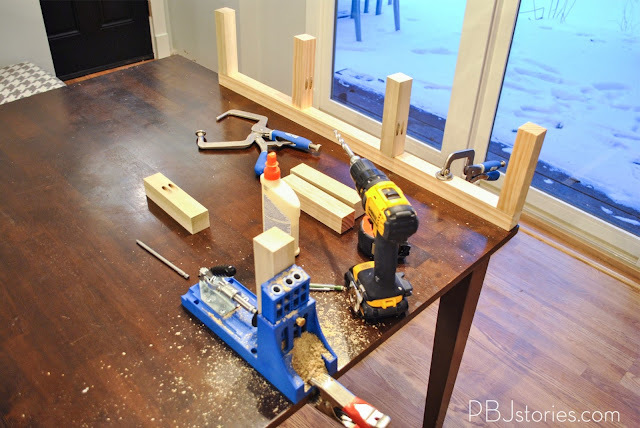 Then you grab your Kreg Jig (why YES I am using our dining room table as my work table... normally I'd NEVER suggest doing that. But (1) I know 100% we're killing that table ASAP so who cares and (2) our garage was freezing in the middle of the winter at this point so I prefer the warmth. Back to the project - I really didn't plan on doing a step-by-step tutorial, but Shanty-2-Chic gals have a great tutorial anyways... so mine's just for context. For the inner guts you want to make these "E" shape brackets. I say "E" shaped, because I was super nervous about only putting one middle support bracket in this shape so I added an extra middles support bar to make an "M" shape. (Original tutorial suggested just one support piece). 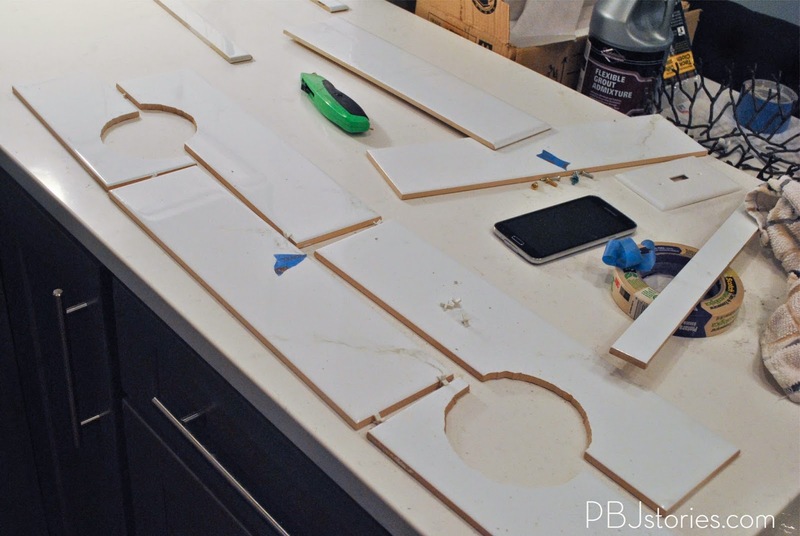 Once the support pieces are made you'll need to attach them to the wall and it's best to find the studs and attach directly to those. 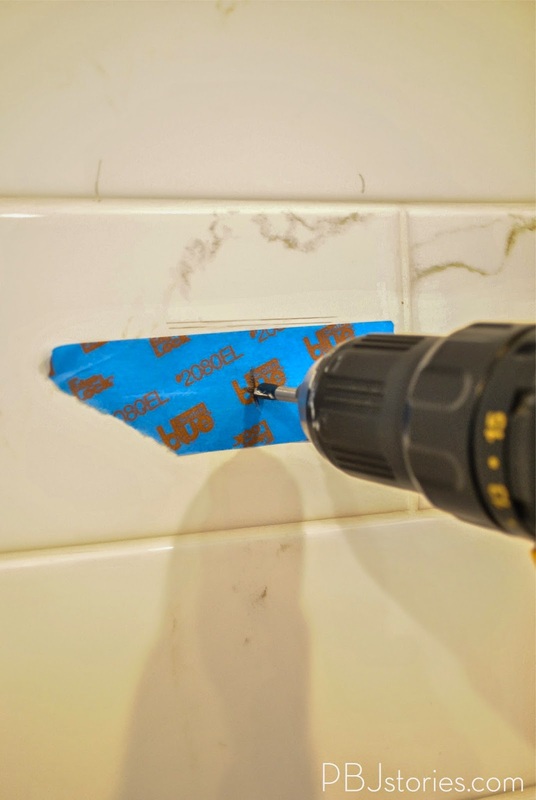 When you're drilling directly into tile you want to be sure you are using the proper drill bit. This one is made specifically made for tile/porcelain so it helps reduce the risk of breaking the tile. 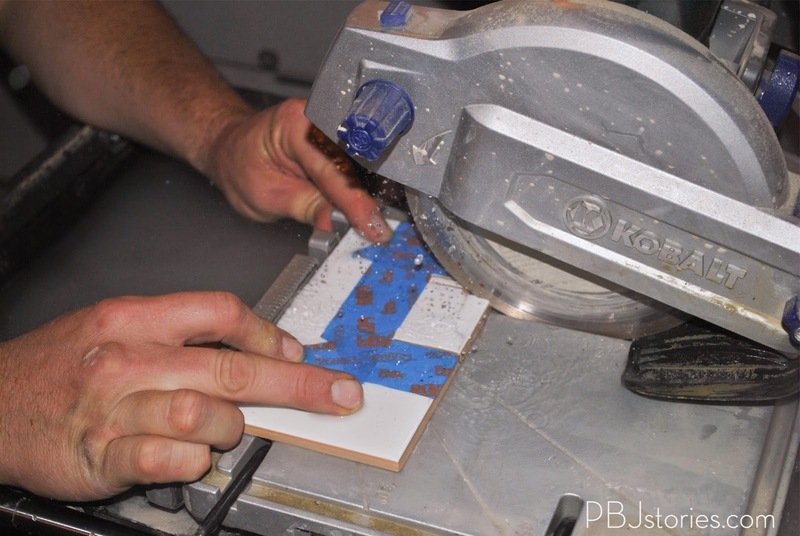 To reduce the amount of splintering, a quick tip is to use painter's tape directly over the hole too. Initially I used 3" screws and installed the brackets but could feel slight slag to them so took them down and used 4" screws. I really wanted to be better safe than sorry. Once you attached the support structure, you can just attach the cover boards. I just attached one 1x10" on top, 1/2"x10" sanded plywood on the bottom, and then a 1x4 on the front to cover all front facing boards. 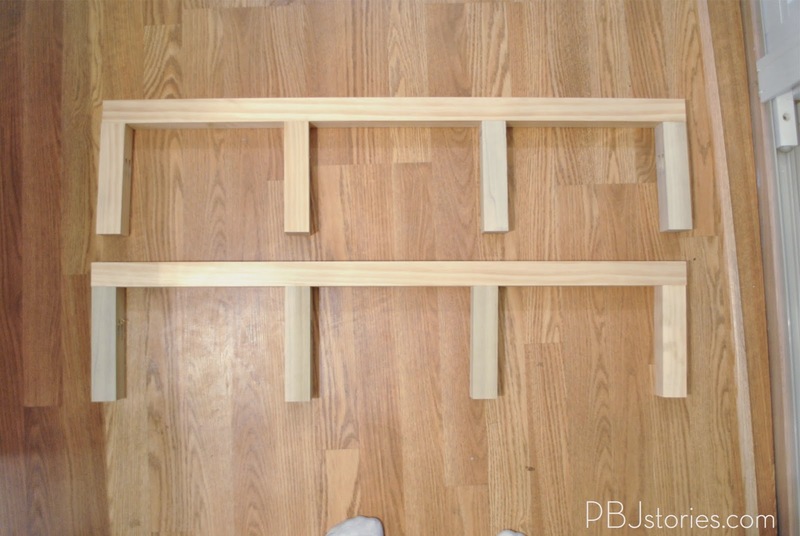 Initially I was going to make the shelves the same thickness, but once I installed it the bottom shelf seemed underwhelming. I ended up changing the dimensions of the bottom bracket to make it 4" thick while the top one is 3". Then just stain, seal, and decorate. There you go, OPEN KITCHEN SHELVES! Per usual, I used Minwax Provencial Stain - it's my go-to stain for any wood project. 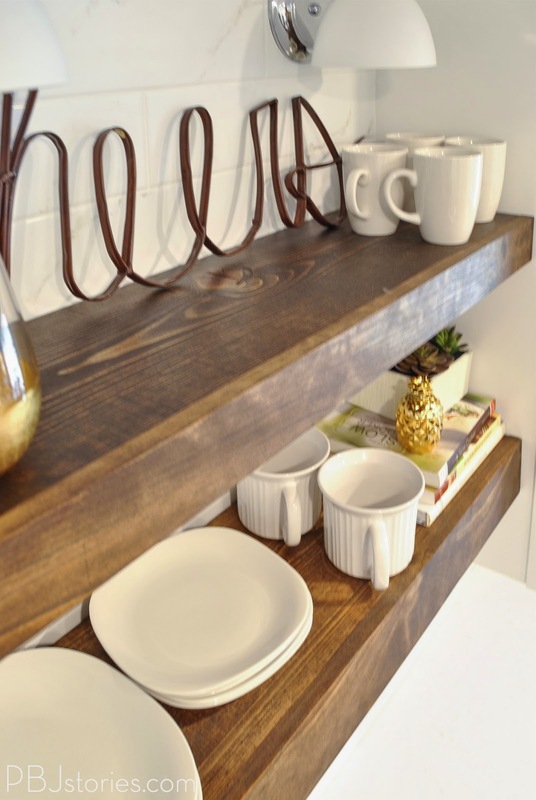 It finishes SO beautifully, accepts the flaws in wood, accents the wood grain and smooths the final finish. Way too happy we have this space for decor and useful space now. What do you think? 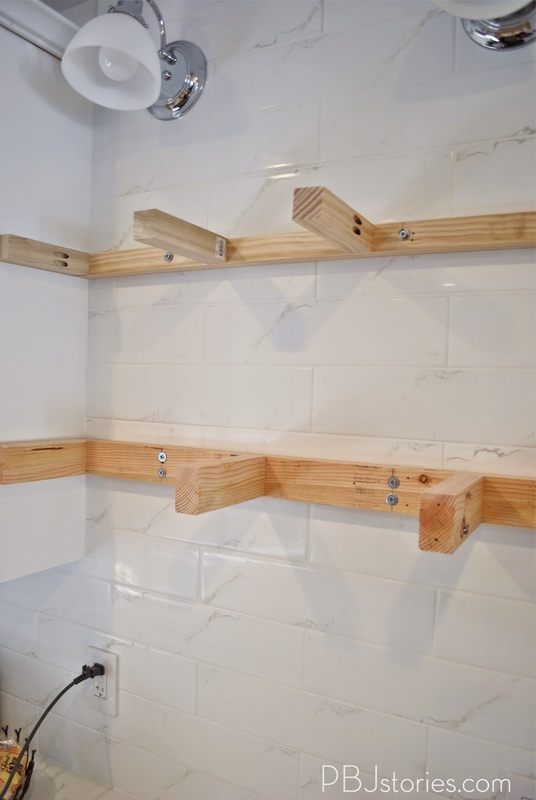 Would you give up truly functional space in your kitchen for open shelves? 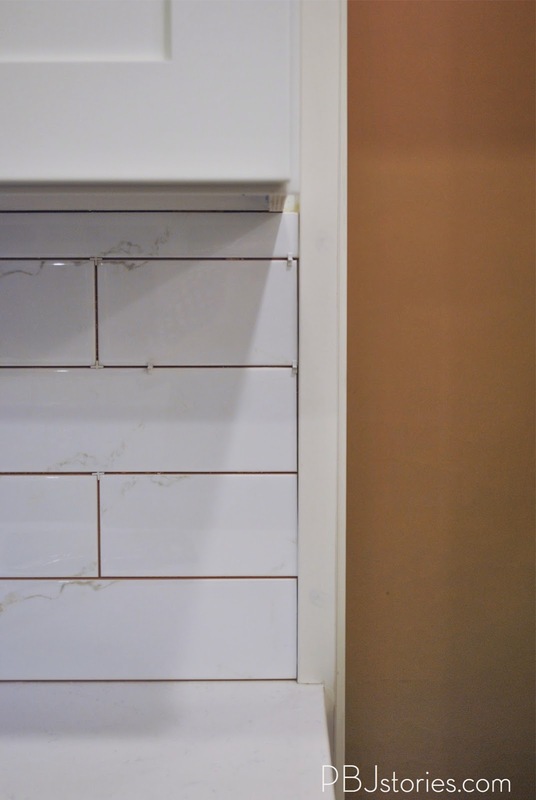 When we finally got to the stage of installing our kitchen backsplash, I could hardly contain myself. 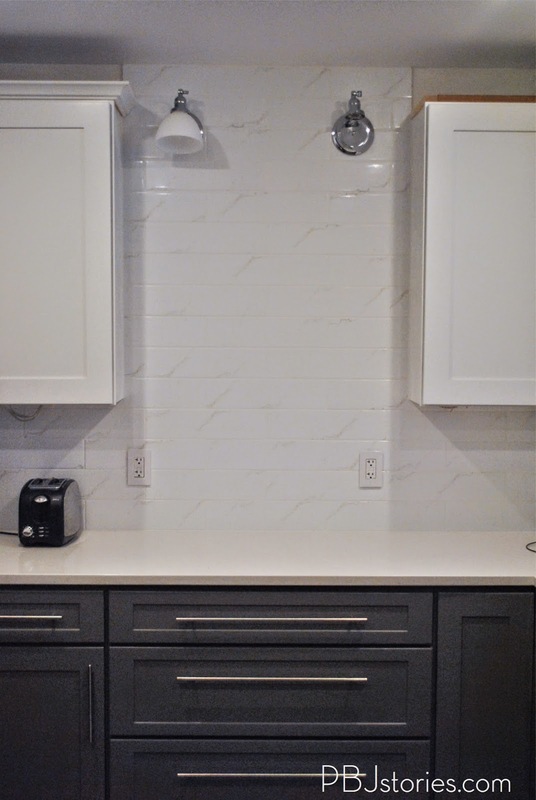 Even though many people don't choose to have a backsplash I couldn't help but feel that our kitchen wasn't complete without it. It was the "big step" that was going to make the space feel <almost> finished! 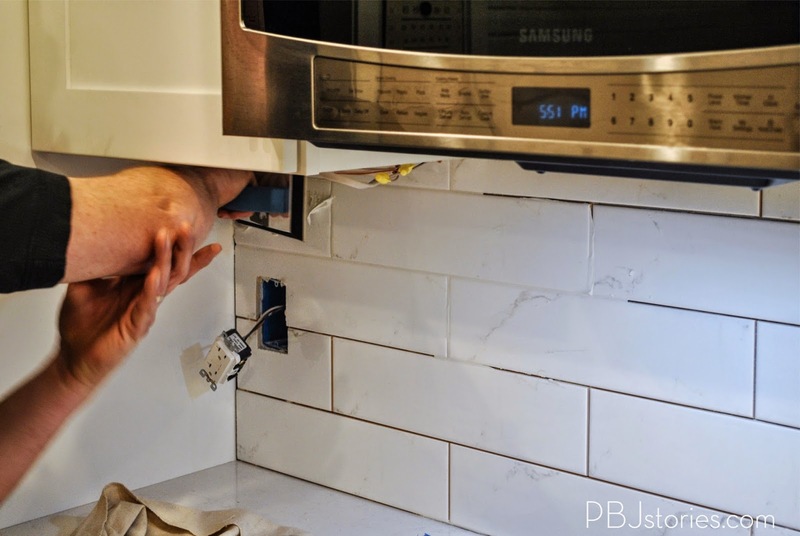 Picking a tile for backsplash can be a daunting task. There are SO many possible decisions - material, tile size, colors, grout size, grout color, pattern of the tile layout. However, I was very happy that I pretty much knew exactly what I wanted the second we walked into this home for the first tour. 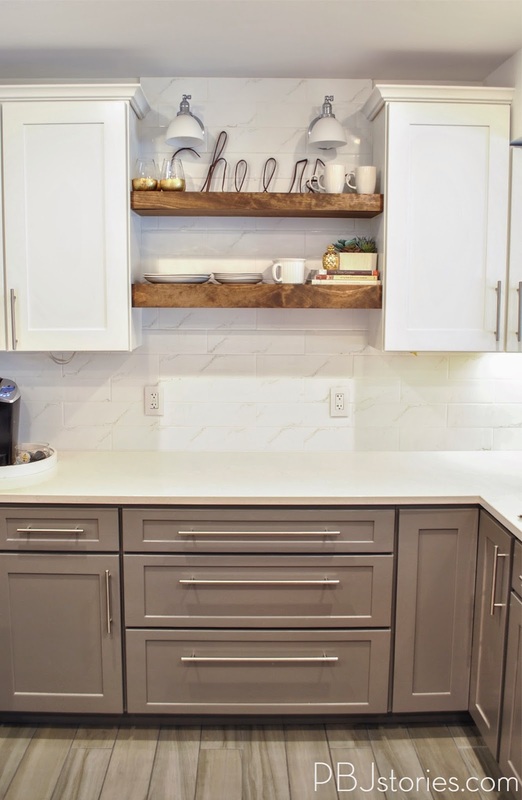 I knew I wanted larger subway tiles, simple pattern layout, white grout and something that made the white cabinets feel seamless. 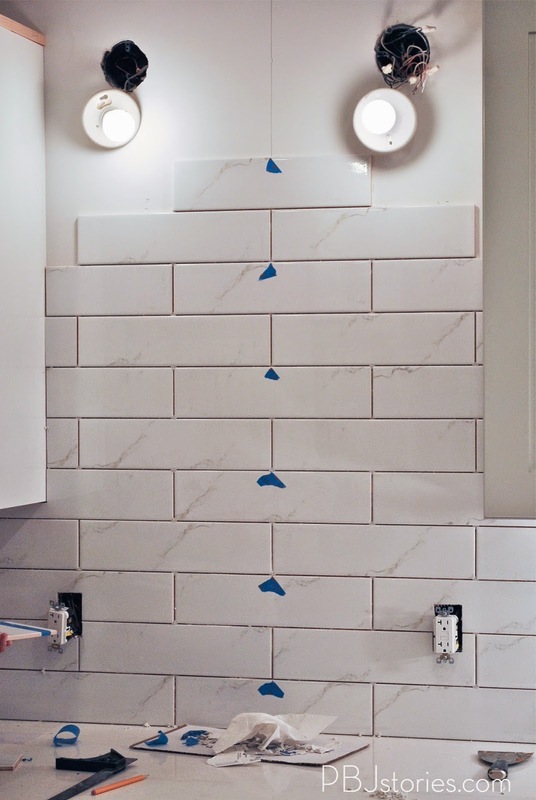 I was very excited when The Tile Shop wanted to work together for my backsplash and told me to go on a shopping trip in their store or online. One trip to their local store and I walked down the first aisle and pretty much the first tile I looked at - I knew was the winner. Talk about luck. 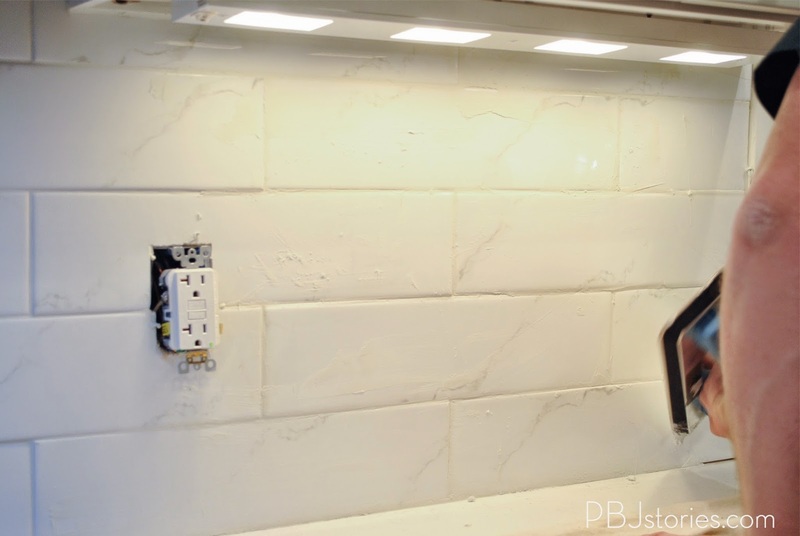 I chose their Calacutta Bianco Gloss Subway Tile - 4x16". It's a bright white subway tile in a gloss finish with subtle grey veins. The veins were sparse enough it wasn't going to compete with our countertops, and the bright white matched the white of our upper cabinets. 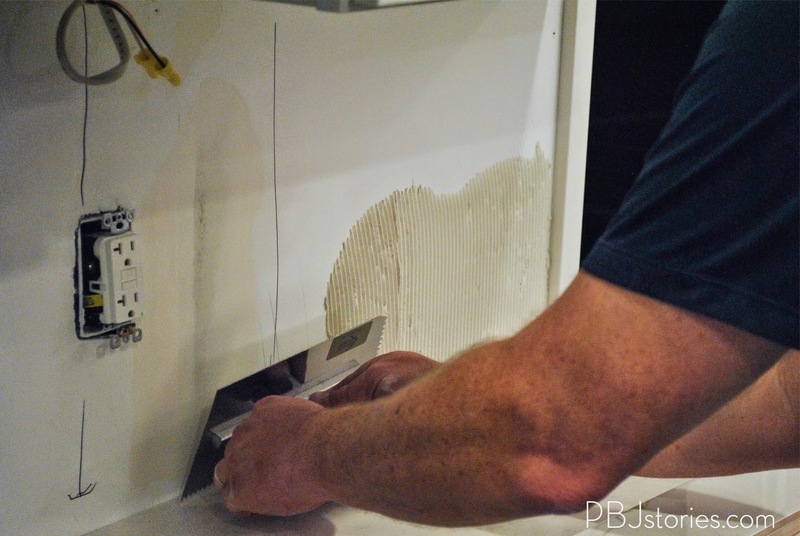 We have helped my Father-in-Law install our backsplash in our first home's kitchen in Virginia so we were at least familiar with the, and his, process. He and I got in a pretty good routine to go through the installation process. A lot of pre-measuring, laying out the tile with the spacers, measuring again, once more to be sure, and then cutting of the tiles when necessary. We started with our shorter of the two walls we were tiling and templated out the full space with the tiles, as you can see above. 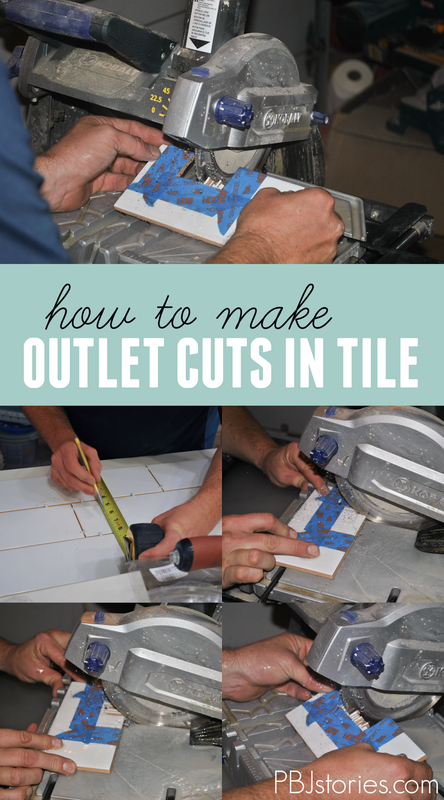 Then we had to go back and measure out where the outlet cuts would be in the tiles. I'm still a little skiddish when it comes to cutting tile. 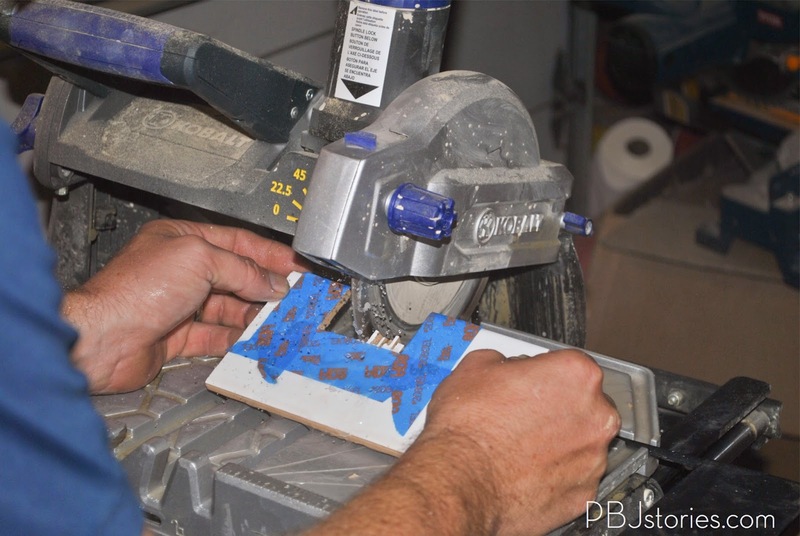 I got comfortable with doing the simple straight cuts, but when it was time to cut out sections for outlets and light switches I let my FIL do all that work. However, he made the process seem pretty easy. We used painter's tape to tape off the measured area of the outlet. Then he'd cut in on the sides to the depth of the cuts. 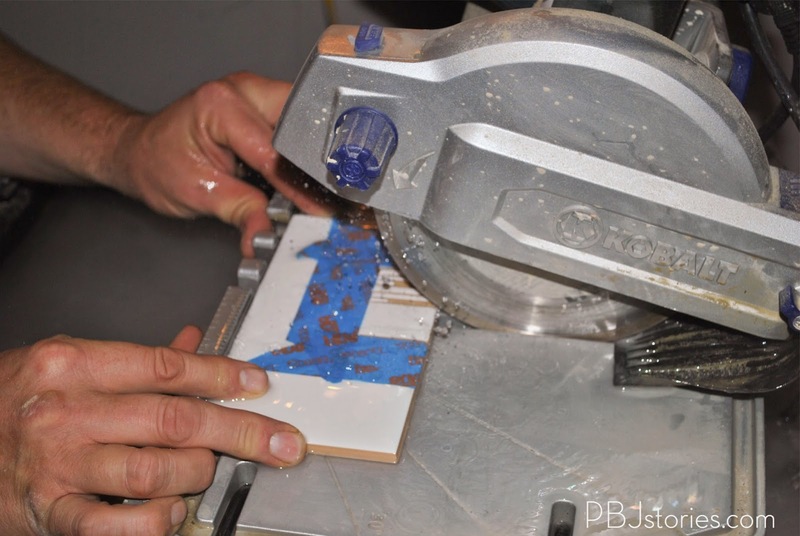 Since you can't make the "horizontal" cut, you have to do many many many cuts to remove the total area. Once we had all the cuts ready to go, it's time for the goop Thinset. 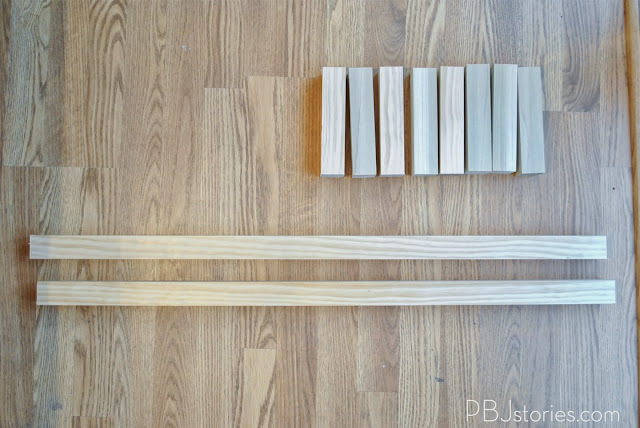 Things I learned along the way: I've heard both thinset and mortar talked about when laying tile... well, what's the difference and when do you use which? Thinset is actually a type of mortar made to go on in a thinner manner. 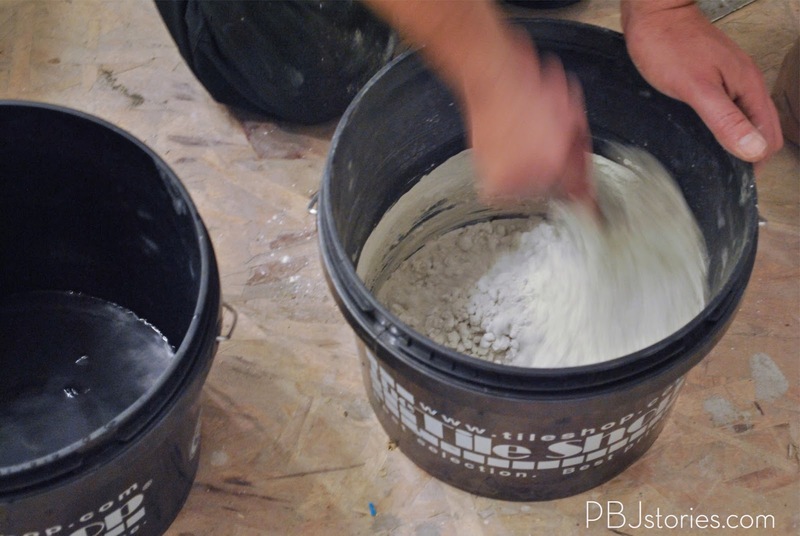 Thinset uses a finer sand than other types of mortar allowing for the thinner bed application like on backsplashes. To mix the Thinset you want to add water to the dry mix little by little mixing it each time to ensure you don't add too much water. 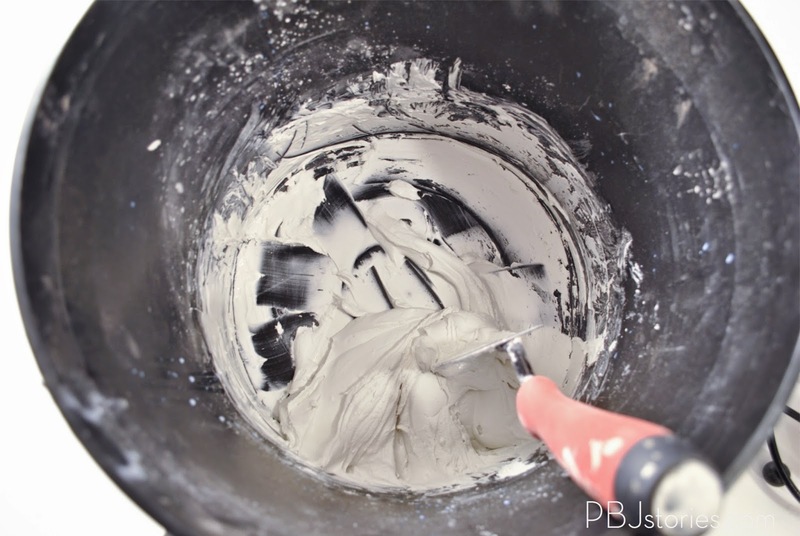 You really need the mixture to be about a texture of toothpaste, or frosting in order to hold the tiles without sagging but be able to be thinned out smooth enough. Ready to add the Thinset and tiles! We hit a BIG hurdle as we finished our smaller wall and moved to our longer wall. 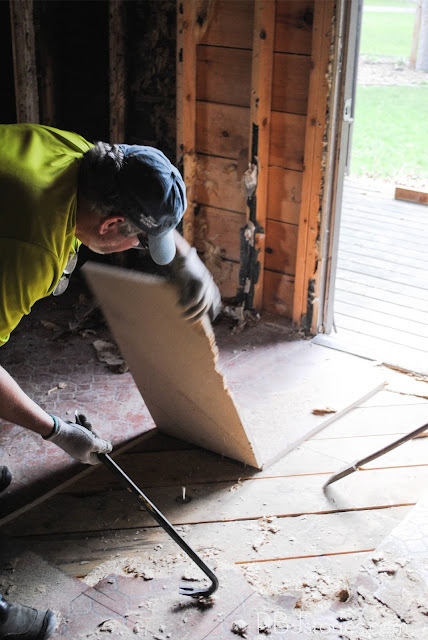 Luckily since we were laying out the tiles first to be sure of spacing and measurements, we were able to notice that our walls were not 100% flat. Despite all the squaring we did when installing sheetrock, and mudding and sanding. 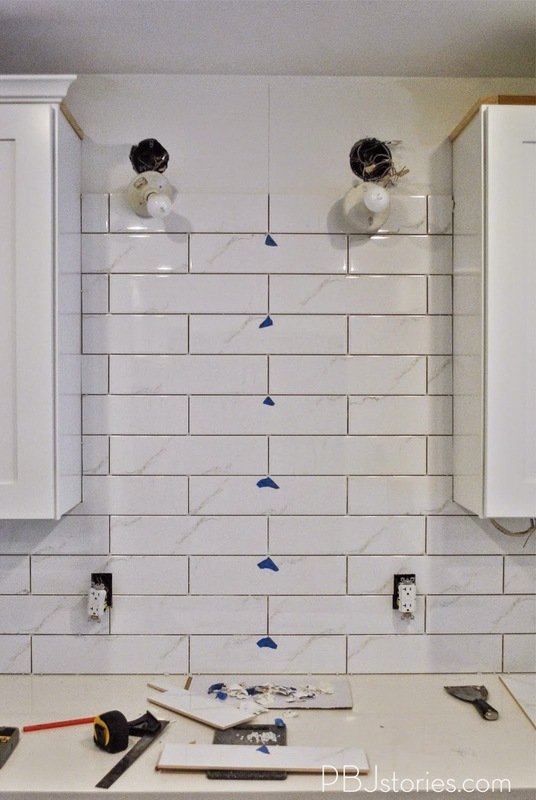 Since our tiles were 16" in length they cover a lot of "real estate" on the wall and when you're crossing over where studs are, where we tapped/mudded, it was bound to not be totally flush. So, we had to go back and mud over areas that had depressions in the wall that would have caused the tiles to not lay flat on the wall. We just added a thin layer, let dry 24 hours and sanded smooth. 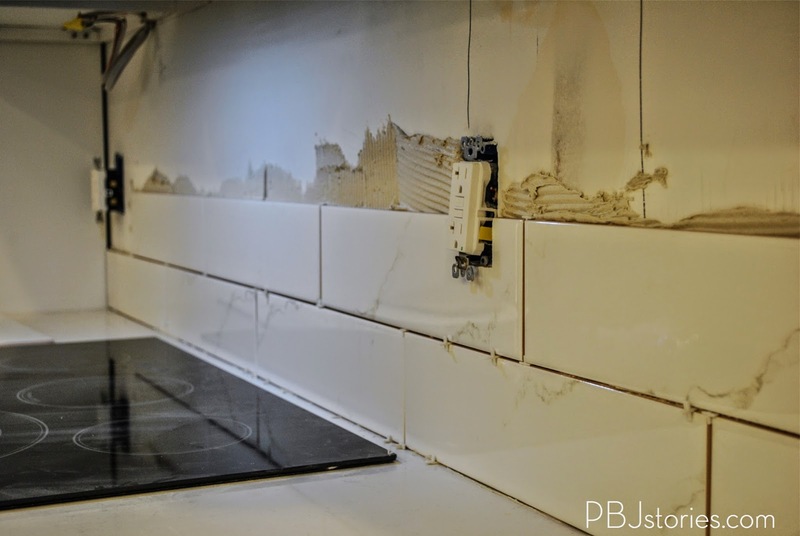 Once that was all fixed, it was time to resume the tiling. 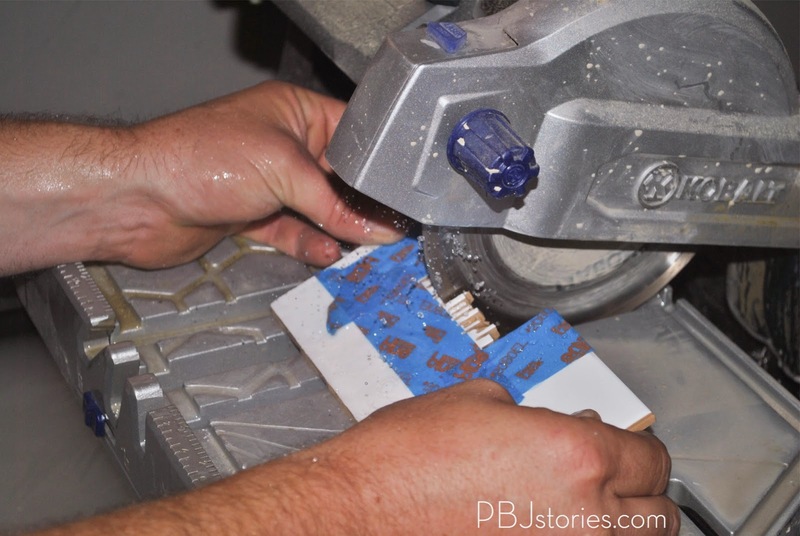 Similar to how we cut the outlet tiles, we had to cut out the areas for the pendant lights. It was a little more difficult since it's a curved area, but we just did the same process as before. 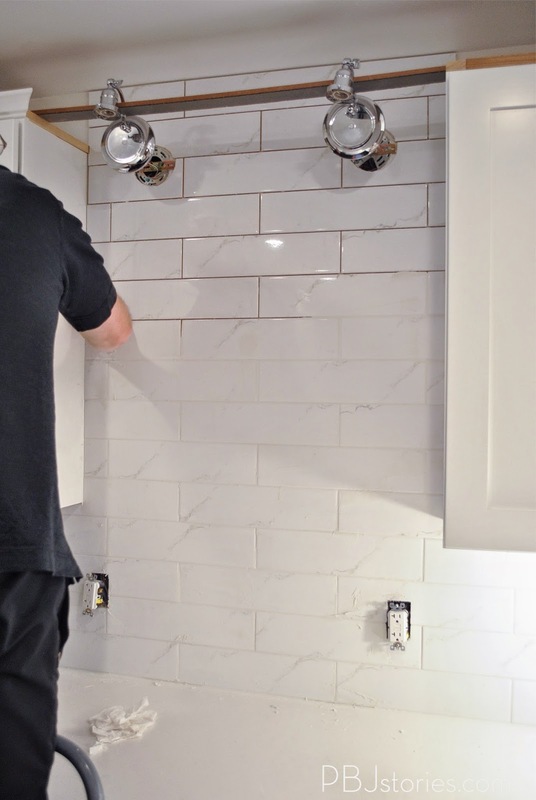 Since I was working with The Tile Shop we were able to use all their suggested products for their grout which is great because they actually suggest using an additive to the unsanded grout powder instead of water. 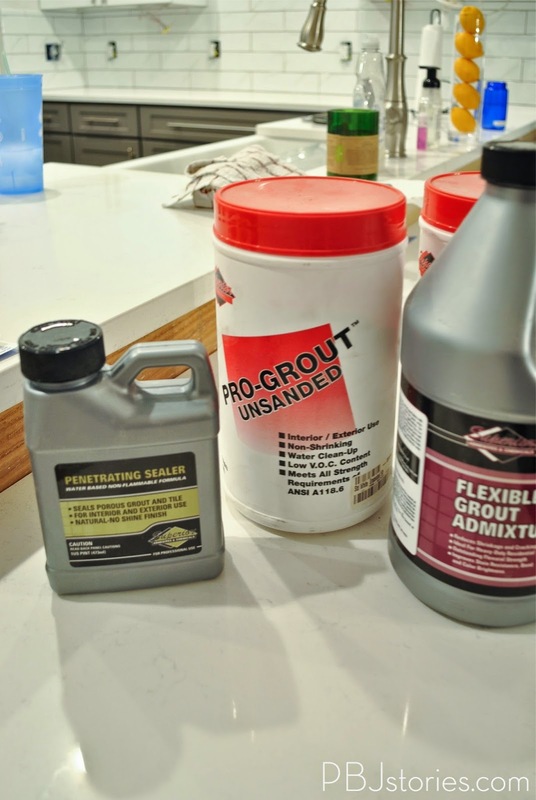 The bottle on the right is the "flexible grout mixture" and just hearing the name made me feel more confident about using it. 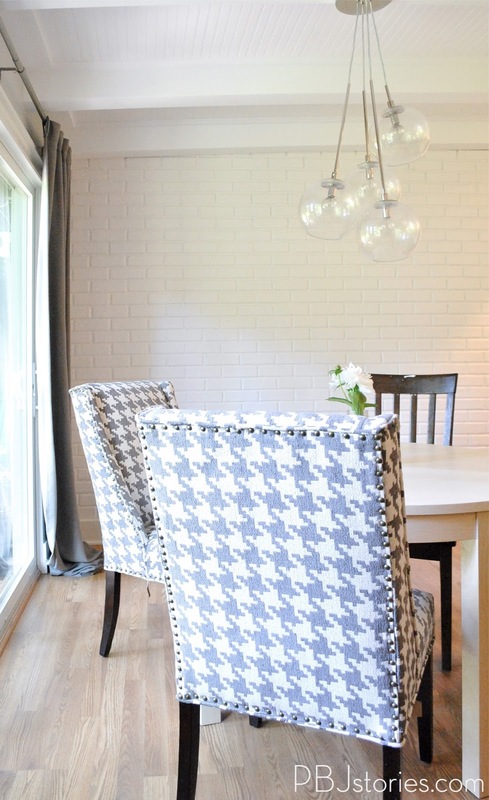 We used a bright white grout, but I did debate for a little using a dark grey grout for dramatic contrast. But, ended up deciding I wanted a more clean seamless appearance. 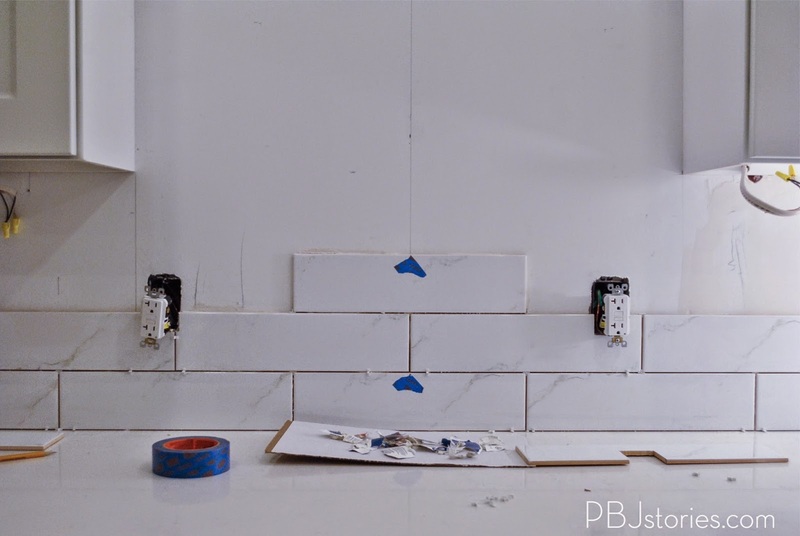 This process is just a lot of smooshing on the grout, being sure it's smooth in the cracks and then going back with a sponge and wiping it off the surface of the tiles. 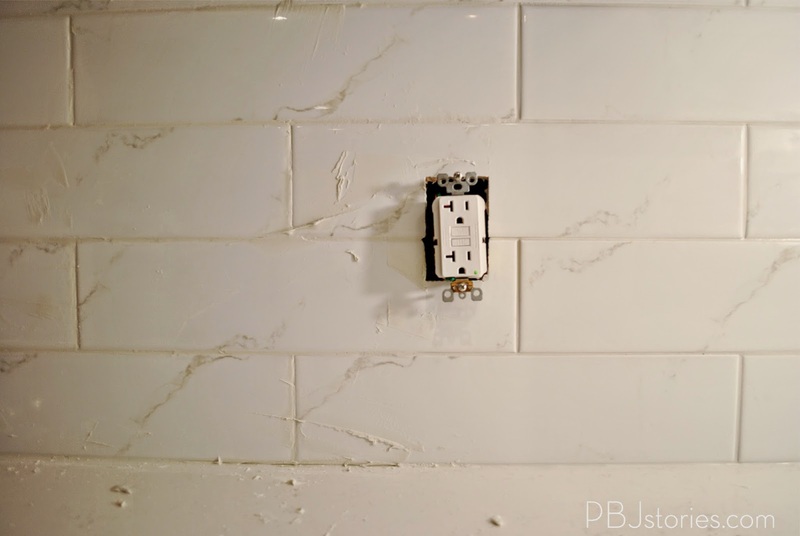 In the picture below you can see the difference of adding the grout (left of the outlet) and once we wiped it down with a clean wet sponge (right of the sponge). 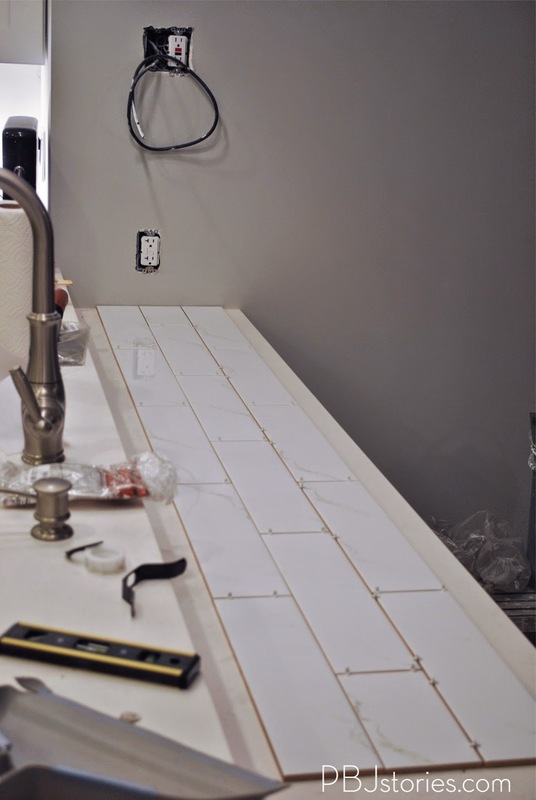 A HUGE thanks to The Tile Shop for wanting to work with me on for our backsplash. Truly impressed with their products and how easy the process was! We're moving along in the kitchen reno - practically done. WHO IS EXCITED TO SEE THE FULL REVEAL!? As always I love to share little glimpse into our lives on Instagram, especially our progress of #PBJreno. 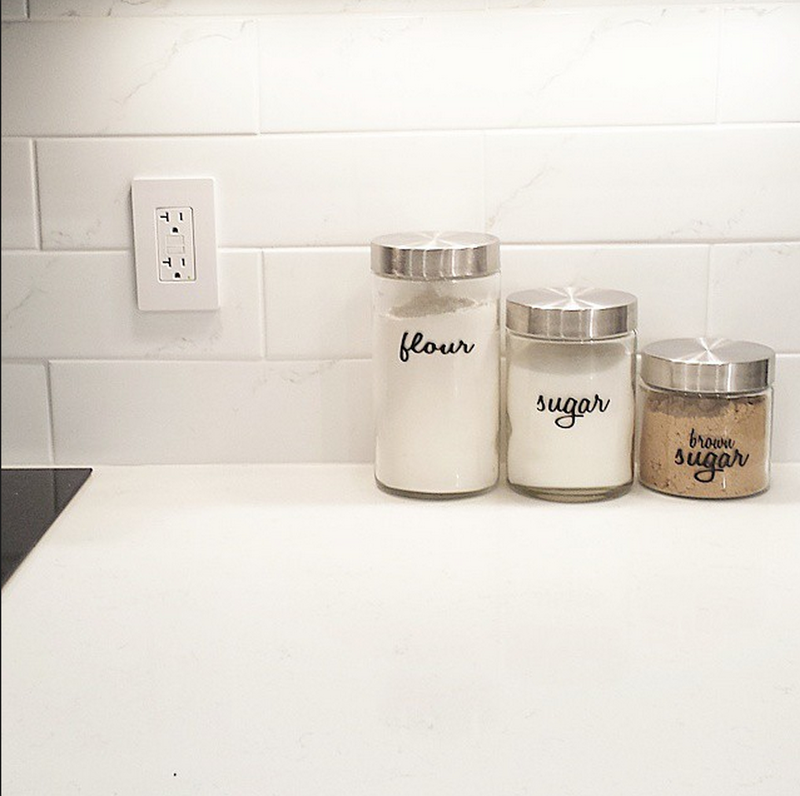 Wouldn't you agree the backsplash looks gorgeous paired with our glass jars?